To reserve a room a deposit of £100 per person is required. This amount is payable when the reservation is made, however company policy states that accommodation for both the Christmas and New Year period must be paid in full by 1st December 2018. Guests who choose to pay the full accommodation cost upon booking can benefit from a 2.5% discount on the accommodation total. All extras will be charged automatically and the bill will be sent onto the billing address. For a stay encompassing both our Christmas and New Year packages, a 10% discount is available. 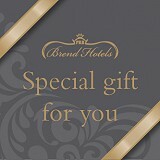 Our Brend Hotels' cancellations scheme does not apply for Christmas and New Year bookings. Should you need to cancel your holiday for any reason we require notification in writing. The appropriate cancellation charges will then be forwarded to you by invoice. We regret we are unable to make any exceptions. Please note that deposits are not refundable at any time, should a cancellation by a possilbility, we strongly advise that you take out separate insurance policy.